This recipe for caprese bread is a rustic loaf topped with melted mozzarella cheese, ripe tomatoes, basil and balsamic glaze. The perfect summer side dish! 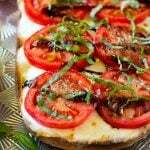 Caprese bread is a great way to enjoy ripe summer tomatoes. In my home, we love all things tomato. A couple of our other favorite tomato dishes are cherry tomato salad and spaghetti stuffed tomatoes. I love all things caprese, especially in the summer time. 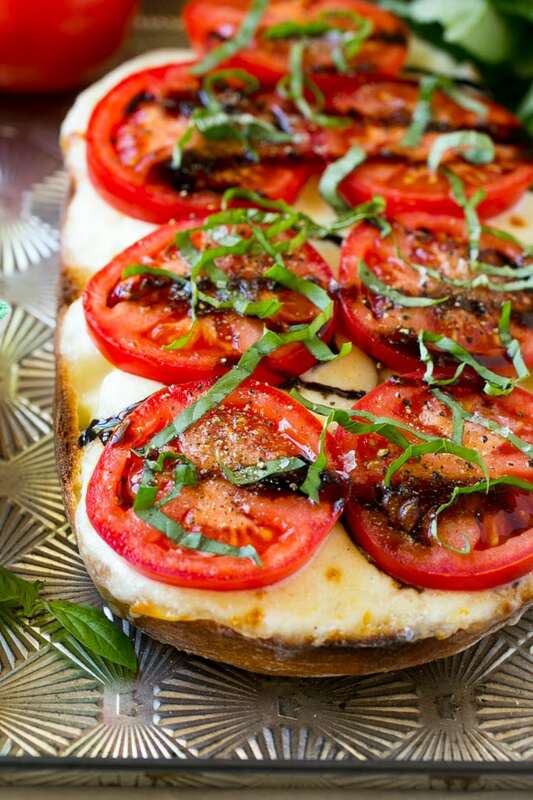 This caprese bread may be my very favorite of all! How can you go wrong with toasted bread, plenty of mozzarella cheese, ripe tomatoes and basil? 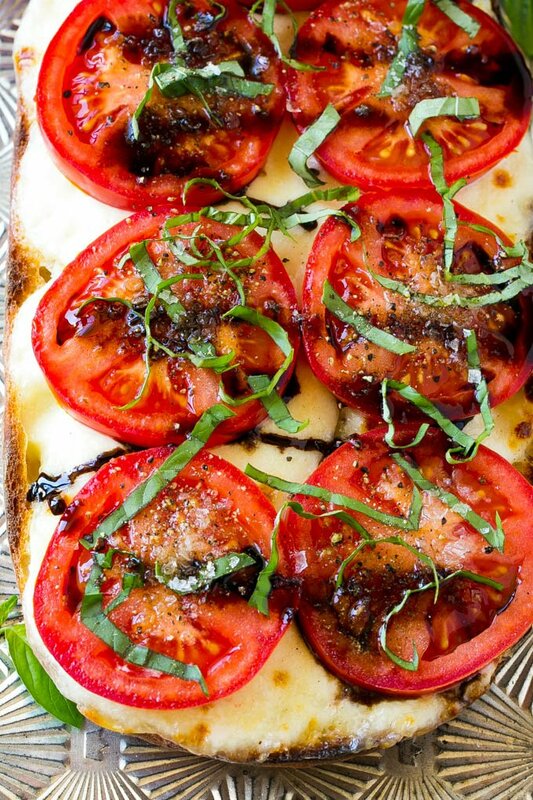 Add a little balsamic glaze and salt and pepper and you’ve got caprese perfection. How Do You Make Caprese Bread? This recipe starts with a loaf of bread. Any rustic style bread will do! The bread is sliced in half lengthwise, then brushed with olive oil and rubbed with garlic. A generous amount of sliced fresh mozzarella cheese is layered over the top, then the bread is broiled to melty perfection. While cheesy bread is good on its own, it’s even better with a topping of tomatoes and basil! I use the ripest tomatoes I can find here. I drizzle the tomatoes with balsamic glaze, then add a generous amount of sliced basil, coarse salt and freshly ground pepper. You can find balsamic glaze near the rest of the types of vinegar at your local grocery store. Balsamic glaze is a reduced version of balsamic vinegar, and it’s thick and mellow flavored, no harsh vinegar taste here! If you can’t find balsamic glaze, you can make your own by cooking balsamic vinegar until it’s reduced by half and syrupy. We all loved this caprese bread – the classic combination of tomato, mozzarella and basil just can’t be beat. It’s super easy to make and is a summery twist on the old standard garlic bread. We’ll definitely be eating this all summer long. 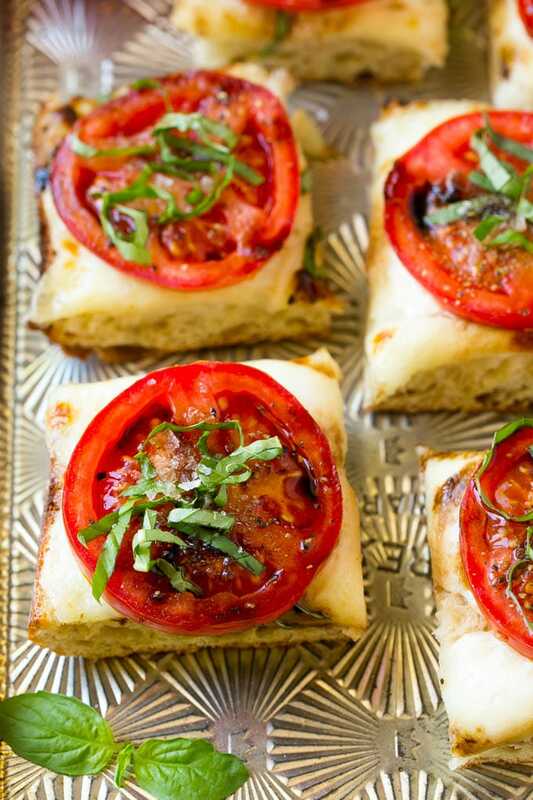 The next time you see some nice tomatoes at the market, pick them up and make this caprese garlic bread – you’ll be glad you did! This recipe for caprese bread is a rustic loaf layered with fresh mozzarella cheese, sliced tomatoes, basil and balsamic glaze. Preheat the broiler. Split the loaf of bread lengthwise. Brush each half of the bread with the olive oil. Rub the cut side of the garlic all over each half of the bread. Cover the surface of each half of the bread with the mozzarella. Place the bread on a sheet pan. Broil for 4-5 minutes or until the cheese is melted. Watch carefully to make sure it doesn't burn! Remove from the oven. Place the sliced tomatoes on top of the mozzarella layer. Sprinkle the basil, salt and pepper on top of the tomatoes. Drizzle the balsamic glaze over the top of the bread and serve immediately. Little Helpers - My girls had a great time arranging the tomatoes on top to make a pretty design. 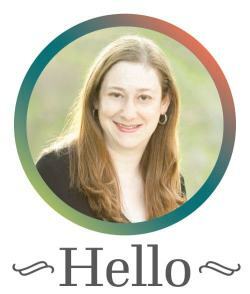 This post was first published June 21, 2015 and was updated July 20, 2017 with new photos. This caprese bread is so good. I reminds me a little of really good bruschetta. I highly recommend this bread. Wow so cute and yummy looking! Need to try it out with fresh tomatoes from a garden. This is so beautiful! Fresh summer tomatoes are my absolute favorite! Thanks! I agree, tomatoes are one of my favorite parts of summer! Great flavors from these delicious ingredients! Love these simple bites that are packed with wonderful flavor. This is just gorgeous! Thanks! It’s definitely a simple concept but it amounts to something delicious! I could eat this for lunch every single day in the summer! Nothing is better than fresh tomatoes and basil on bread. Love this! Thanks, I kind of want to eat it for lunch every day too! Nothing like simple ingredients to showcase nature’s finest!!!! Love the layering of the gorgeous tomatoes and the pesto and mozzarella are the perfect accent to the dish!!! I love tomatoes, though it’s taken me a long time to come to them. These look especially delicious! Thanks, tomatoes are one of my favorites, especially in the summer! Anything with heirloom tomatoes is a winner in my book. DELISH! I totally agree, I am drawn in by the colors every time! This is so GORGEOUS! I love heirloom tomatoes they are such a summer treat, and I love this caprese recipe, what a fun way to enjoy tomatoes. They are a real treat, wish they were available year round! Wow, can I come pick some of your tomatoes?! Our plants are still really small but we started them late.